In Leicestershire we are ambitious for our children and want to do all we can to provide them with high quality services. For our children in care we will provide good quality care and placements to help them reach their potential. The Care Placement Strategy outlines the county council's ambition for how we will design, develop, deliver and commission services of a high quality that place children and their needs firmly at the centre. The Children & Family Services Continuous Improvement Plan (The Road to Excellence 2017-2012) arising from the Ofsted SIF in 2016 has identified areas for changes and the need for key strategies to be developed in order to improve outcomes and impact for children and young people. There are a number of national and local drivers which underpin the need for Local Authorities to look innovatively at what is being delivered in relation to children in care. Some of the national drivers are embedded in the legislation, Working Together 2015, and a national focus on child deaths, a focus on adoption and permanence; all in the context of a national and local programme of austerity and funding reductions. The majority of Local Authorities have seen an increasing number of care applications and children being accommodated. While the average looked after child rate in Leicestershire has continued to increase over the last four years it still remains significantly lower than those of statistical neighbours. Adoption rates are showing an improved picture however older children with complex behavioural needs continue to present challenges in relation to permanence but also are reflecting a significant increase in spend on external placements. 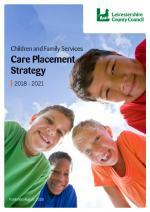 In developing the Care Placement Strategy work it is necessary to determine what services may be necessary to meet the needs of children both on the edge of care and in care and how permanence for children and young people can be achieved at an earlier stage in the child's journey. The Strategy acknowledges the need to co-invest, co-produce and co-deliver services with Partner organisations to optimise outcomes for young people and ensure where possible efficiencies in costs are achieved.